Guidebooks to Andalucia tend to focus on the justifiably world-famous cities of Seville, Granada, and Cordoba. However, the historic but far less well known town of Antequera is equally worth a visit and its relative lack of fame means that its essential Andalucian charm remains undimmed by coach parties and souvenir shops. Visitors to our villa in Andalucia tell us often how much they enjoy visiting Antequera! Antequera is a medium sized, increasingly prosperous and stylish town about 38 miles inland from the coast at Malaga. As you drive down from the Montes de Malaga on your way to the villa, it is a wonderful sight as the vega (plain) of Antequera opens up before your eyes, a wide, lush, green plain sprinkled with little white farmhouses shimmering in the sunshine. This is the moment when you know you have reached the real Andalucia - an entirely different world from the coast! One of the first things the vistor will see is the nineteenth-century Plaza de Toros (bullring), where during the Ferias of May and August you can see the most famous bullfighters in Spain in action! Close to the Plaza de Toros is the beautiful tree-lined promenade of the Paseo Real, which finishes in a large children's playgound where the town's smaller inhabitants play on the warm summer nights. Here the locals like to meet, walk and relax in the shade of the giant trees lining the park, and enjoy the warm evenings of the Andalucian summer. The visitor then usually turns south from the bullring up to the Infante don Fernando (named for the leader of the conquering Christian army that retook the town in 1410), the main street of the town which leads up to the the historic area. Leading off from the Infante are any number of streets with wonderful shops. This is a shopaholics paradise, where you can buy beautiful shoes, handbags, silverware and exquisite embroidered shawls typical of Andalucia. And for those who want to pusue their own Andalucian dream, this is where the estate agents are! Do not miss the covered market with its array of fresh seafood, and be sure to pick up some delicious pastries handmade by nuns from the local convents! 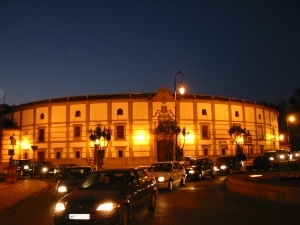 The Infante brings you up the historic part of town where the original part of Antequera stretches up the hill from the Plaza de San Sebastian to the Castle. Just a short walk and you find yourself in a different world of narrow, whitewashed streets, flower-decked Andalucian patios and even older churches. Climb up higher and you can see right over the red roofs and belltowers to the rolling countryside of Andalucia beyond. And don't forget while walking to stop every now and then for a cool drink or a tapa. Wherever you walk there is another beautiful old building or ancient church and always the smell of something delicious cooking as you pass the bars! Being a genuine Spanish town and not tourist trap, Antequera is wonderful to visit at any time of year. You may wish to celebrate Christmas as the Spanish do, or enjoy a relaxing Spring break, or to see the deeply moving processions of Holy Week. The people are friendly and welcoming, and justifiably proud of their beautiful town. For those with stamina we recommend a visit to the Feria at the end of August. Casetas (temporary bars serving a variety of food and drink spring up all over the town and the day is spent meeting friends and sampling the offerings of several different casetas. After an exhausting day eating and drinking ( in very high temperatures!) the hardy inhabitants dress up for the Fiesta and venture out for the night (all night!). Even young children come along to enjoy the rides at the giant funfair. In conclusion, do not miss out on a visit to Antequera during your holiday at our luxury villa in Andalucia. It is a chance to see the very best of Andalucian life and culture, and we guarantee that your first visit will certainly not to be your last!